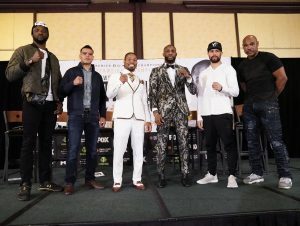 With all of the hype that is surrounding the big showdown between Errol Spence Jr and Mikey Garcia, it is easy to overlook this weekends matchup between current WBC Welterweight champion Shawn Porter (29-2-1, 17 KOs) and Yordenis Ugas (23-3, 11 KOs) but make no mistake about it, this is a must see fight. The contest is scheduled to take place at Dignity Health Sports Park, in Carson California. With so many great fighters in the Welterweight division, Porter seems to be the forgotten man. On Saturday March 9th he will be looking to remind everyone just exactly who he is. In Porter’s last contest he picked up the biggest win of his career when he out pointed former two division champion Danny Garcia for the vacant WBC crown. In the first defense of that title Porter will undoubtedly have his hands full when he takes on Yordenis Ugas who is riding an eight fight win streak and has gone undefeated ever since making his debut in his new weight class class in 2016. The fighting style of Porter is well chronicled as he uses his non-stop pressure and volume punching to make it a long night for his opponents. What can be deemed his strength could ultimately lead to his demise against the Cuban born Ugas who uses his slick fighting style to make his foes miss and pay. Don’t mistake Ugas for your typical Cuban fighter who doesn’t engage in all out brawls as he has no problem mixing it up on the inside. To say that this contest is a must win for both men would be an understatement. Not only is Porter looking to defend his strap for the first time but he is also looking to make a statement. Super fights with Manny Pacquiao, Errol Spence Jr and others are within his grasp if he can just get past his tough Cuban foe. For Ugas this is the biggest fight of his career and one that he has worked extremely hard for. He has looked sensational since joining the Welterweight division but can put an exclamation point on his career renaissance with a win over Porter which would lead to his first world title. The fans will be tuning in to see two of the best Welterweights on earth go toe to toe but will be equally as entertained in the co main event as Francisco Santana (25-6-1, 12) will be looking to put an end to the five fight win streak of the hard hitting Abel Ramos (23-3-2, 18 KOs). Both of these men campaign in the Welterweight division and will be looking to impress as they vie for their own title shot sometime soon. Since losing a close majority decision to current title contender Jamal James, Ramos has won five straight matches all via stoppage. He has quickly turned himself into a possible future contender with his vaunted power. He will however, need more than that if he hopes to extend his streak. Santana recently found himself in a major rut, losing two fights in a row and three of his past five. That all quickly changed when he defeated the highly regarded Felix Diaz by majority decision in his last contest. That win placed his career back on track. With another impressive performance he can find himself in the championship mix. Porter vs Ugas is sure to be a non stop action packed fight but don’t be surprised if Santana vs Ramos steals the show.